Transparent Labs PreSeries BULK Review - Superior Ingredients? 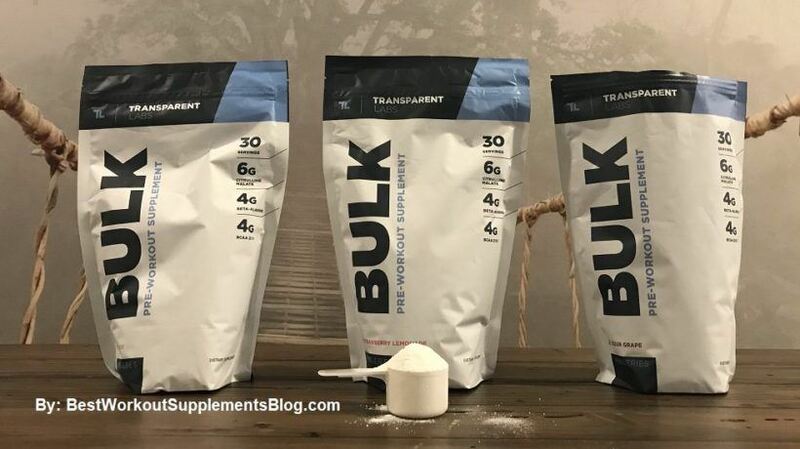 Here is our complete experience reviewing PreSeries BULK plus our ingredient analysis. The pre workout BULK by Transparent Labs has become increasingly popular over the last few years. It feels like once you learn about this pre workout, you don’t stop hearing about it. 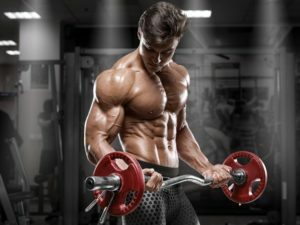 This lead us to want to try it ourselves, and find out if there really is a difference between PreSeries Bulk and all the other pre workouts out there. As supplement gurus who are always looking for the best pre workout, BULK exceeded our expectations both in the gym and on the label. Though that might not be the case for you. 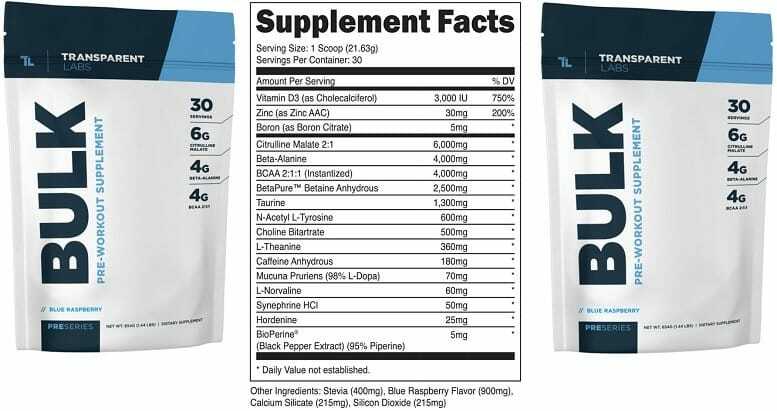 Here we’re going to share our review of BULK with you and explain the pros and cons for this premium pre workout. The energy makes you feel wide-awake and confident. The formula contains fully dosed clinical ingredients. Definitely improves performance and exercise duration. Clean ingredients, naturally flavored and sweetened. Larger serving size requires more water. Taste is a 7/10 compared to other pre workouts. Costs more (though, is definitely more valuable). PreSeries BULK in one sentence: PreSeries BULK is an extremely well rounded pre workout that achieves high quality levels of energy, strength, endurance, and overall performance enhancement. From the start, BULK is a character of a pre workout compared to other mainstream brands. When it came in the mail, there wasn’t any aggressive advertising or suggestive claims (1)(2)– just a giant super-sized bag of pre workout. As you can see in the image above, the serving size for BULK is quite big. Despite this, it mixed well and didn’t leave a pile of grit at the bottom of our glasses like some other large-serving pre workouts have. Taste wise: we weren’t impressed the first time we reviewed this pre workout. However the new flavors like strawberry lemonade, grape and orange are quite good so new users should be happy. But regardless, this isn’t a pre workout that we take for taste, after all it isn’t cheap. This is a pre workout we take for the ingredients in it, in large servings supposed to actually do something. The most interesting thing about taking BULK compared to other pre workouts is the way that it kicks in. While most pre workouts hit you in the face with energy, and then fade out quick; BULK slowly increases your energy more and more into your workout. We experienced a clean boost of energy 30 minutes in, however 60 minutes in we found ourselves with even more focus and energy… When most other pre workouts would typically begin fading. Really it was an incredible experience: focus wise, strength wise, and endurance wise. All without the fallout of huge caffeine dosages both post workout and long-term. 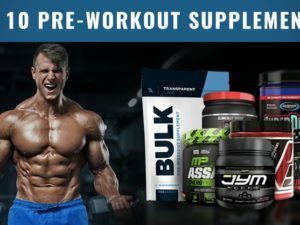 What exactly are the ingredients in PreSeries BULK? One good thing about BULK and Transparent Labs products in general is that their effects can easily be linked to specific ingredients. No proprietary blends, no mystery ingredients, just clinically backed dosages that most brands are too cheap to include. The BULK formula can be broken down into two basic components, performance optimization and energy optimization. L-citrulline malate: Bulk contains 6 grams of l-citrulline malate, which is the clinically relevant dosage for increasing performance. We’ve explained l-citrulline malate in great detail here if you’d like to learn about how it works. Beta-alanine: Bulk is loaded with 4 grams of beta-alanine per serving. Unlike what other brands would like you to believe, the true clinical dosage of beta-alanine is 3.2 to 5 grams (3). Bulk nails the sweet spot with 4 grams while most other pre workouts contain less than 2. Branch chain amino acids (BCAA): You’ll find 4 grams of BCAAs in Bulk, which is an adequate dosage for improving performance. Though, to also improve recovery you will want to get around 8 grams per day. Betaine anhydrous: An often overlooked ingredient, Bulk contains 2.5 grams of betaine anhydrous per serving. Betaine leads to greater strength and muscle growth over time (4). Taurine: Popularized by energy drinks, taurine has a negative rep as a one trick pony. However the 1.3 grams of taurine in Bulk attributes to muscle hydration and overall improves performance (5)(6). L-norvaline: The pump in PreSeries Bulk lasts quite a while, and l-norvaline is likely why. L-norvaline acts to stop the natural breakdown of arginine, allowing more to flow through the nitric oxide pathway. Caffeine anhydrous: You may not realize it, but caffeine is the most popular ingredient in pre workout supplements. In fact, the beneficial effects of many pre workouts can be completely attributed to its caffeine content. Bulk on the other hand contains a mere 180 mg of caffeine – that’s all it needs. L-theanine: Naturally found in green tea, l-theanine acts to reduce the anxiety that caffeine can cause. This allows you to get all the energy you want, without compromising a smooth train of thought and calm heartbeat. Bulk contains 360 mg of l-theanine per 180 mg caffeine which is the most advantageous ratio. Synephrine: Synephrine is a unique stimulant that is the reason why the energy from older pre workouts used to be so freaking good. You won’t find it often today, because retailers like GNC have banned it due to being similar to ephedra (though safer)(7). This ingredient adds a unique shade to Bulk’s energy complex that you won’t find in other pre workouts. N-acetyl l-tyrosine: Commonly referred to as NAC, n-acetyl l-tyrosine acts to replenish tyrosine levels in the brain, leading to enhanced mood and focus. Mucuna Pruriens: Mucuna is a unique ingredient typically included in testosterone booster or growth hormone products. However it works quite effectively in Bulk to increase dopamine adding to Bulk’s clean energy experience. Hordenine: A unique nootropic stimulant, Hordenine completes the PreSeries Bulk energy blend with long lasting focus typically not possible with such a low caffeine dosage. Based on our quality preferences and overall experience taking PreSeries BULK, this is by far our favorite pre workout to date. We geek pretty hard over it. The performance enhancement and overall ergogenic benefit outweighs everything else on the market. The premium price. This pre workout is definitely worth $49. In fact we’d argue that it is probably worth more than that. However, like all things, you need to stay in your budget and live within your means. Sensitive to taste. We like how BULK tastes, however it doesn’t compete with many of the new candy-themed sugar loaded pre workouts out there. If you’re picky about taste over performance, not for you. Stimulant addict. If you typically take hyper-caffeinated products or questionable stimulants, then you will likely need a few weeks of caffeine-detox before you’ll get the desired clean energy from BULK. Basically, you’re too fried by less responsible brands. You won’t find PreSeries BULK on Amazon or in GNC because they want to keep the price low. Note: Our staff has re-reviewed BULK on multiple occasions to include flavors: blue raspberry, green apple, strawberry lemonade, sour grape and orange.